Another opportunity to get some silvers practise in before the 'Moor and back to Sumner's fishery with Hathers and crew. 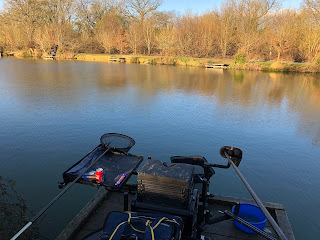 After learning from last week, the match plan today if the peg allowed it, was to have a single long line that would be fed heavily from the off and left to settle, a waggler line and 5 metre line for the roach. Today's weather was pretty horrid and the car was showing 2 degrees as I arrived at the fishery. The wind was a nasty north easterly and blowing straight down the lake. 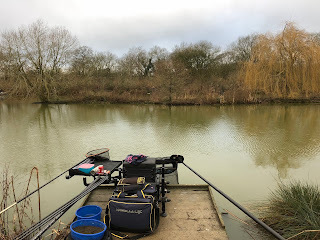 Peg 12 which is permanent peg 21 the far end of the right hand bank and today somewhat sheltered from the wind. As per the match plan 14.5 metre pole line straight ahead towards the peg opposite. Close in lines to 5 metres including a margin line and the waggler rod out of the bag. Bait list today, maggots (red/white) and casters including some ground bait for the long line. First outing for 2018 and some much needed practise ready for my week at Stafford Moor. So today I was out with the MFS lads at Sumners Fishery, Horsham on the match lake. My last visit here was back in 2012 however that was a carp match and I had a fantastic day recording my PB match weight at the time. As usual it was great to see a lot of the lads I'd not see for a while despite much Mickey taking as I'd prepared a bacon sandwich for our match organiser Hathers. The weather was pretty mild around 10 degrees with a gentle south westerly wind even though the day before it had rained for most of the day. Peg 16 which is permanent peg 30. Looking at my peg I decided to fish four pole lines, two would be fed negatively and the others positively. So I opted for two lines at 14.5 metres at 10 o'clock and 2 o'clock positions, the other two lines would be at 5 metres. I also managed to find the same depth on all lines so one rig would cover them all.